I am a native of Chicago, Illinois. My writing and photography have been featured at Memoir Mixtapes, Hobart, the Brevity blog, Cease, Cows, Rose Red Review, Literary Orphans, The Masters Review blog, Tiny Donkey, Booma: The Bookmapping Project, Drunk Monkeys, The Writing Disorder, Eunoia Review, Rockwell’s Camera Phone, Wilderness House Literary Review, We Said Go Travel, and the Encyclopaedia Britannica blog, among other places. You can find some of my published credits here. I also authored a blog with a travel theme called Writing and Wayfaring from 2011 to 2015. My short story “Bad Babysitter” was nominated for The Best Small Fictions 2018. Back in the day, I studied culinary arts at a community college and worked many years in retail, hospitality, and food service. Beginning in the mid-1990s I spent several summers living on the Aran Islands off the west coast of Ireland and in County Down in Northern Ireland, where I worked in a hotel (on Inis Oírr) and a cafe/conference center (in Castlewellan). I returned to the United States in 2001. Somewhere in the middle of all this I got a Bachelor of Arts in English from Southern Illinois University in Carbondale and have worked as a proofreader and copy editor. I have also traveled (with a work exchange here and there) throughout France, Australia, Mexico, Bolivia, Spain, Puerto Rico, Portugal, and my own home country. I ran my own tour company (Wayfaring Women Tours) for awhile (2010-13). In 2011 I walked the 500-mile Camino Frances route of the Camino de Santiago, from the south of France to Santiago de Compostela in Spain. I come from a big Midwestern family of Norwegian-Irish heritage. I currently reside outside Chicago, with a pair of beautiful cats, down the road from a railroad tracks and across the street from a lovely muddy old river. Chicago, Dunning neighborhood, 1976. 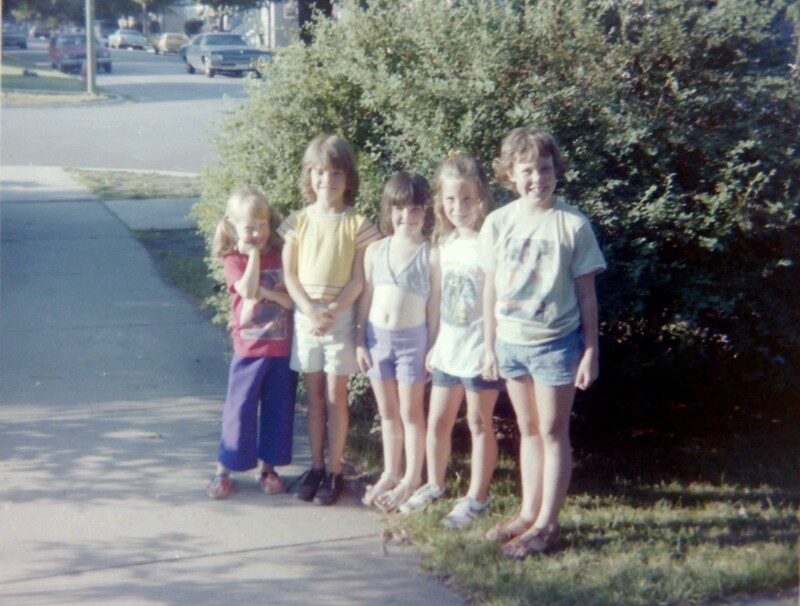 My sister on the far right, me on the far left (in purple floods, Mickey Mouse sandals, and a red Sylvester Stallone t-shirt). My sister has on a beige version of the Stallone shirt. In the middle are three neighborhood girls: two Stauntons and a Stepek.